But let's start from the beginning. How is this even possible to have a compass in a browser? Well almost all smartphones and tablets have it. This works like a real compass and - in case you are wondering - you can have fun and make it go nuts with any magnet (like the ones you probably have on your refrigerator). That easy... Well, no. But for now let's assume it will work and draw the needle on canvas. So we have the angle and something to paint on. We now need to draw a line that rotates when an angle changes. Rotation is a bit tricky but this is not that bad. * alpha is a normalized angle where 0°/360° is North, 90° is East and so on. It works! ...or does it? Well I had 2 device at hand 3 browsers at each. Native - eventData.alpha is ranged from -180° to 180° where both 180° and -180° means North. Firefox - doesn't support DeviceOrientation event. Opera - doesn't support DeviceOrientation event. Native - doesn't support DeviceOrientation event (WTF?!). Firefox - eventData.alpha is ranged from 0° to 360° where both 0° and 360° means North. Opera - eventData.alpha is ranged from 0° to 360° where both 0° and 360° means North. The real testing - madness comes! OK, so real normalizing is not a one-liner (as the one above), but few state variables, if-s and one function later you get a working example. North becomes North. Great! But wait... Rotating works funny... It turns out we have 3 browsers and 3 cases. It's like the good old times ;-). What happens? Firefox gives you 90° for East, but Opera gives you 270° for East. Yupi! Tell the user to rotate his device clockwise. If he will do it the other way you're app is screwed. Figure out if the angle is getting bigger or smaller. Not that easy! After getting 5° you might get 360° but you should wait at least until you are at 330° to avoid user mistake. Make yet another transformation of the direction angle. * Basic device orientation handling which includes heading relative to magnetic North. OK. So that should work everywhere it can work. Still it's hard to calibrate, so users might have problems using it. Some extra calculations might make it easier, but still many browsers (also in modern devices) don't support device motion events. So it's still not a prime time for compass in browsers. 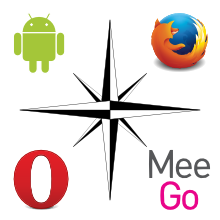 However if you want to add compass to your web-view based app you can use PhoneGap (or other Cordova based framework). See compass API documentation on Apache Cordova page.